Plants infested with scale are often noticeably limp and their foliage is off-color. A closer look reveals small clusters of bumps or cottony masses along plant stems or the ribs or edges of the leaves. Some leaves may be yellowed or there may be dieback at the ends of twigs. Some leaves may be shiny and sticky from the honeydew that scale excrete as they feed. Sometimes ants are present, “herding” the scale insects, much as they do certain types of aphids, so they can harvest this sweet honeydew. Some leaves may have a dark gray or black coating of sooty mold on the honeydew, which further disfigures affected plants. 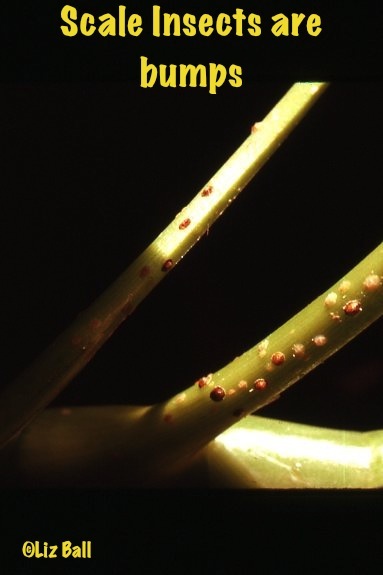 Outdoor plants can handle some scale infestation if they are otherwise vigorous and healthy. Natural predators usually control them. However, indoors where there are no natural predators scale is a serious threat to houseplants and decorative trees such as ficus and citrus. Any scale on a houseplant is too much and should be treated promptly.